Fifth Third Arena on campus at the University of Cincinnati in Ohio is receiving a technology upgrade with 36 new LED displays from Daktronics. The main focus will be the new nine-display centerhung configuration featuring 3.9 million LEDs for nearly 2,000 square feet of digital canvas suspended above the playing surface of the venue. In total, the upgrades will bring more than 7 million LEDs and 5,700 square feet of displays to the arena. 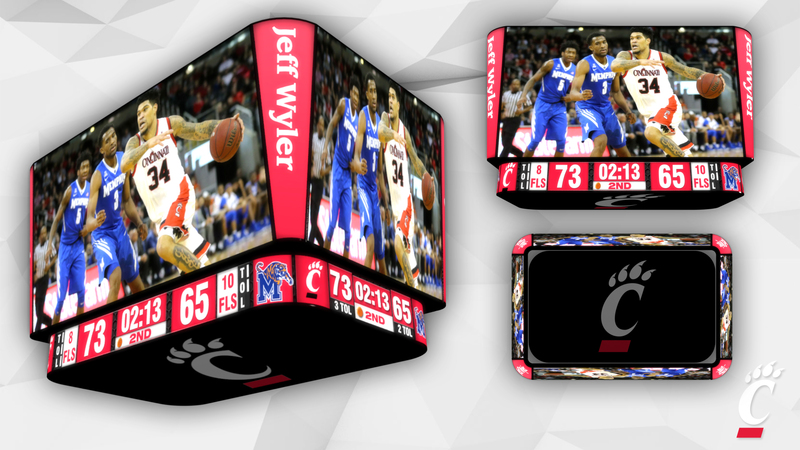 Concept art of the new LED Displays in Fifth Third Arena. The new centerhung displays will feature a tight 6-millimeter line spacing for greater resolution and image quality that can be seen from every seat in the arena while the centerhung ring display will feature 10-millimeter line spacing. The centerhung configuration creates a rectangle shape with rounded corner displays between the main displays. The two displays facing the sidelines will measure 16 feet high by 27 feet wide and the two displays facing the ends of the arena will measure 16 feet high by 16 feet wide. The four curved corner displays will measure 16 feet high by 6 feet wide. The ring circling the centerhung will measure 3 feet high by 86 feet in circumference. The new main displays are capable of variable content zoning which allows each to show one large image or multiple different zones of content including live video, instant replays, up-to-the-minute statistics, graphics, and sponsorship messages. 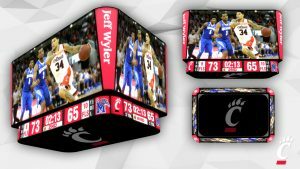 Along with the centerhung display, fans attending events at Fifth Third Arena will notice four additional 8.5-foot high by 14.5-foot wide, 6-millimeter, upper-level LED video displays, and four 9.5-foot tall by 28-foot wide, 10-millimeter, ring LED video boards on the four corner pillars of the facility. Ribbon boards will surround the court on all four sides along the seating fascia. Each ribbon display will feature 15-millimeter line spacing to provide supplemental information and graphics to the main display as well as allowing the opportunity to highlight sponsors throughout events. At court level, 10 LED scorer’s tables and two stanchion displays mounted to each basket support provide additional visibility for statistics and sponsors. Outside the arena, a new marquee display will welcome fans to events. All 36 displays can be controlled from one easy-to-use solution, Daktronics Show Control System. This system provides a combination of display control software, world-class video processing, data integration, and playback hardware that forms a user-friendly production solution. “Our control solution is capable of great things including layering and transitioning that can make your event production look like a broadcast-quality experience for your fans,” added Mihal.